How Long Does Bankruptcy Stay on a Credit Report? Whether to file bankruptcy can be a difficult decision. One of the biggest concerns of those who face a potential filing is the consequences they'll experience as a result of declaring bankruptcy. Though it will negatively affect one's credit for several years and stay on a credit report for a decade, it does not mean one can never buy a house or car again. The bankruptcy eventually comes off a credit report, but this doesn't mean it ever completely disappears. Your credit report is a history of your debts and payments that is often used to determine your creditworthiness. It can also be used by an employer to assess your level of personal responsibility. Bankruptcy is one of the most negative marks that can appear on a credit report because it usually indicates debts that were not entirely repaid. Though an employer cannot discriminate solely on the basis of a bankruptcy, the bankruptcy can be a factor in hiring. Does Bankruptcy Appear on a Background Check? But bankruptcy is not the only negative mark on a credit report. In many cases, a debtor has been delinquent on one or more debts prior to filing for bankruptcy. Even if the debts are eventually paid in full, these delinquent debts will damage a credit score. But, more likely, the debtor will have at least some of them discharged in bankruptcy. 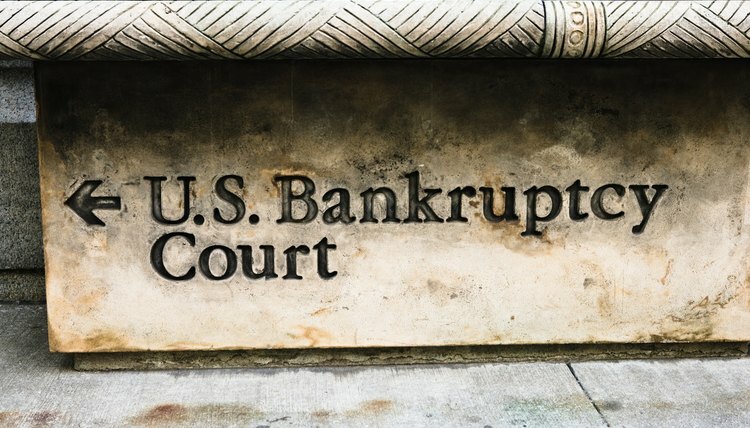 Not only does the fact that bankruptcy was filed appear on a credit history, but the disposition of each individual debt is also reported, including whether it was delinquent, charged off by the creditor or discharged in bankruptcy. Bankruptcy appears on a credit report for 10 years. During this time it will negatively affect the overall credit score, though this will decrease over time if the individual remains in good standing. Other negative marks on the credit report associated with the bankruptcy, such as delinquent payments and charged-off or discharged debt, appear for seven years. A bankruptcy does not just "disappear" from a credit report after 10 years. First, it must be removed, and this might not necessarily happen 10 years to the day. It's a good idea to get a copy of your credit report from all the major agencies to verify that the bankruptcy has been removed. Second, just because the bankruptcy is no longer reported it doesn't mean that a record of it doesn't exist. Bankruptcy proceedings are a matter of public record. Employers and creditors can phrase application questions so as to make evasion difficult or ethically ambiguous. For example, if asked "Have you ever filed for bankruptcy?" people who had debt discharged more than 10 years ago or who filed for bankruptcy but dismissed the case prior to a discharge will have mixed feelings about simply answering this question in the affirmative. There are penalties for falsifying information on a credit application, and it's probably better to be straightforward with a potential employer even though, technically, the bankruptcy is no longer affecting your credit score. How Long Does a Bankruptcy Filing Stay on Your Credit Report? How Long Does a Foreclosure or Bankruptcy Stay on My Credit Report? Nicholson, Joseph. "How Long Does Bankruptcy Stay on a Credit Report?" , https://legalbeagle.com/5266453-long-bankruptcy-stay-credit-report.html. Accessed 20 April 2019. What Is the Statute of Limitations on Bankruptcy Fraud? How Long Do Missed Payments Stay on a Credit Report? Do Arrests Show Up on a Background Check?